Welcome Competitors and Spectators to the Factacular Cup competition form! This is the place to be when checking up on the status of the Factacular Cup at any given time as well as the place to go when wishing to wax lyrical, place hoodoos on competitors, or cheer on your heroes. These will be the posts to check when looking up the current state of the overall competition. I want to take this opportunity to wish all contestants the best of luck and to remind everybody of the importance in regards to completing received random brainoffs within 24 of receipt and I'll thank you all for that in anticipation. Refer to this area when reviewing results of ALL matches AFTER the Factacular Cup Qualifying Round. Just click on the link relative to the match you wish to review. If the link is not present or the opponents show "TBA", that round and/or that random challenge has yet to occur. If you see a player's name in bold, it means they have been declared the match winner. Reserved for replays, if required. The Factacular Cup Qualifying Round has been completed and Round One seedings have been posted. Round One matches will be issued at approximately 02:30 hrs, Tuesday, 30 May 2017, UTC. EDIT - All Round One matches have been issued. Hmmmm - me vs Quiz! Be afraid very afraid! That's me I'm talking to by the way! I'm from Melbourne, chooky's from Melbourne. A great Round One match-up! Loser has to do a quick sharpie dance, okay? Or maybe the winner should. I heard that a couple of nice boys called LMFAO recommended the Melbourne Shuffle a few years back. They then went on to make their own song about it. For years (ok, maybe months), the Access database that I created in order to facilitate the Factacular Cup had been going wrong. I was perplexed. I wrote the code and tested it......WTF? I forgot about an important table within the system called "Member Register". This table contained vital information about currently active players and alternate methods of ID. So, when new members entered Factacular, I, like an idiot, did not adjust accordingly. Welcome to the real world.....where programmers say "I got ya fam!" and then produce a meaningless piece of crap. Or forget fundemental reasons why a system exists. I say this because I depend on you guys to call me out. My system(s) cannot get better unless something I have overlooked is made plain to me. So....the reason I was about to give up? I had not updated the member registry file. As a result, new members were recorded, but not noticed by the overall system. It was your typical "D-OH!" moment magnified by 100. Lesson here? Stop thinking that programming looks after everything. Round Two matches have been issued. jmax, mockies = moccasins. Do you remember the Sharpies? Maybe it was just a south-eastern suburbs thing. I don't know from personal experience either - I was still in primary school on the other side of the country when the Sharpies were in their hey-day but today even respectable Melbournians are allowed to go about in a pair of mockies if they wish. Just around the house of course. And to the shops if you really, really need milk or bread. Semi Final matches have been issued. As we are ahead of schedule, the Factacular Cup FINAL match will be issued at 00:00 hrs, Friday, 2 June 2017, UTC. 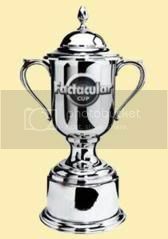 The Factacular Cup Final has been issued. I promised my vanquisher I'd support him in the final. Am I being my usual incompetent self in that I can't post on their final quiz? Here's the small ribbon: nothing personal against you, Captain. You should be able to post there so long as you are signed in. Truly incompetent - I can't even read, just missed it first time when scrolling through the list of brain-offs, I'm not sure I should even be confessing this. 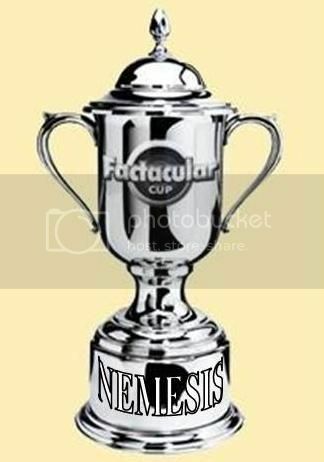 The Factacular Cup tournament has been decided. Award to follow. Congratulations Cap'n Pugwash for another definitive win! Next time maybe Quiz.....you already know there is a cup out there with your name on it. And a big thanks to all particpants. "I think Rudyard Kipling said it best: If you can make one heap of all your winnings and risk it all on one turn of pitch-and-toss, and lose, and start again at your beginnings, and never breathe a word about your loss, yours is the earth is everything that is in it, and, which is more, you'll be a man, my son." Shuddup you old coot! That doesn't help at all. Sorry I haven't been available to answer. I've been experiencing one of those bugs that invades your thoracic area to restrict your breathing, makes your joints ache (in this case, my lower back) and treats you to various unpredictable chills and fevers. It hit me last Saturday. I am still not quite over it. Apart from crawling up to the desktop to check on the tournament, I have been doing a lot of sleeping. And working out why my system has been behaving badly........member registers......keep them up to date. Mental note made. Anyway, yes chooky, I remember "sharpies". But weren't there also "droogs"? Those were the ones with shorn hair but kept the back of the neck length long. Rat tails? I know that they had that weird dance when they bounce their heads listening to HUSH singing "Glad All Over Over". I remember this though......in Melbourne during that period there were gangs and it was kinda frightening if you think back. But if there was one track that made me think we had a handle on Chuck Berry's style of rock, it was Ted Mulry Gang's Dark Town Strutter's Ball. ANYTHING can be made to rock. Even songs dated 1917. WD40 is what you need Tinman. Thanks for running this tournament despite your problems. Still looking for 1 or 2 for this weeks's Kevvie.